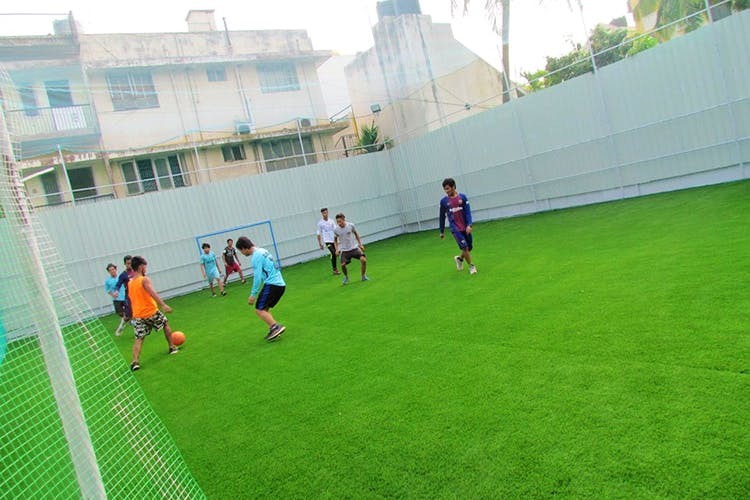 Dribble n Gobble Arena in Koramangala's 5th Block makes a game of football interesting with its five-a-side football pitch and mini cafes that you can hit up post game. Dribble n Gobble keeps things simple with its five-a-side football arena with floodlights and safety nets to ensure the ball stays in court and not in someone's backyard. Booking a one-hour slot costs you INR 1,200 but when you have 10 people playing, it's INR 120 per person! The pitch opens at 6 in the morning and the last slot is midnight. You can book a maximum of two hours at one go. They are also open to hosting mini tournaments and leagues, so corporate folks around Koramangala, you know which ground to pitch to your HR, right? Locker and bathroom facilities come without question, but we like the little chill out area outside the pitch where you can strategise before the game, regroup during halftime, and post-match analysis. The chill out space comes with a few kiosks selling milkshakes, snacks life puffs, sandwiches, crisps, and fresh juice. You can book the ground via the Playo app.